Orenburg is a unique geographical bridge between Europe and Asia. It not only lies on the imaginary border between these two regions of the world, but it is also a junction of natural areas—forests and steppes, Russian plains and the ancient Ural Mountains. Orenburg was founded in the late 18th century for the purpose of establishing trade relations with Asian countries and the protection of the nomads: The local Cossacks not only guarded the borders, but also engaged in trade. In the winter, the Orenburg carts, laden with salt and frozen fish, went to Moscow and St. Petersburg. Unlike many cities in Russia, fall in Orenburg is warm, and freezing temperatures begin only at the end of November. Early October morning greets the rare passers-by with its orange glitter of sunlight, which adds color to the roofs of the trading arcades and the local synagogue. Empty morning streets are ideally suited for a stroll and exploring the city. You can easily walk across Orenburg’s historic quarter; there is only a little left of what it looked like before the revolution. Four central pedestrian streets covered with pavement can tell Orenburg’s entire story—the cannon yard built from red brick, Rychkov’s and Timashev’s white mansions made in the style of early classicism, the military hospital’s two-story yellow building and large park, blazing with all the colors of fall. These buildings have remained intact here since the 18th century, when the city was founded. The rays of the morning sun illuminate plaster moldings and cast-iron shields. The main part of Orenburg’s historic center are the 19th-century buildings—the brick fortress of the former guardhouse, which became the city’s Museum of History, the Noble Assembly House, speckled with bas-reliefs of late classicism, the resplendent Caravanserai with an octagonal mosque in the shape of a Bashkir yurt. Orenburg is multinational. The number of nationalities in the city almost exceeds that of Europe—there are 119. Here, it seems, all the main religions of the world are represented: There are more than 30 Orthodox churches, a restored 19th-century Roman Catholic cathedral, eight mosques, a synagogue with the Chief Rabbinate of Russia representative, Lutheran churches and even a Seventh-day Adventist church. 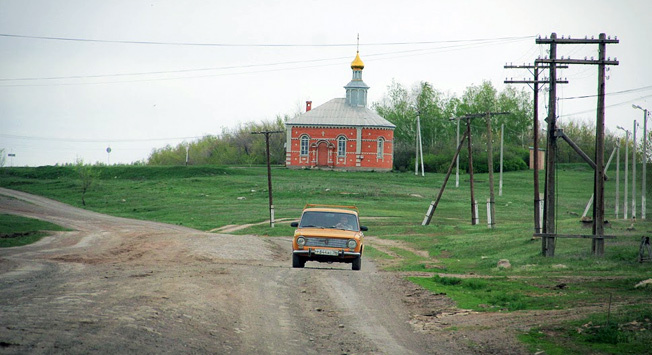 Adventists, by the way, are very rare for Russia’s remote areas. The city was built according to the “Master Plan,” which was approved by Emperor Peter I. Thus, it was one of the first cities designed by professional city planners. During World War II, Orenburg was one of the centers from which a lot of the industrial equipment and entire businesses were evacuated. Since then, the military Yak and ballistic missiles have been manufactured here. After the war, many factories were converted for the production of vacuum cleaners, incubators, and machines for processing meat, which were bought all over the country. For Russians, however, Orenburg will forever be associated with a song about "the Orenburg downy shawl"—the famous, silky and extremely warm item of clothing made from the down of local goats. In the city’s surrounding region, you can see almost more than in the city itself. For example, some 45 miles from the city of Orenburg is Sol-Iletsk, located on the border of Kazakhstan. Here are the world's largest deposits of rock salt. Sol-Iletsk is also known for its salt lakes and mud lakes. Salt lakes do not freeze, even in extreme cold: From depths of 6–10 feet to the very bottom, temperatures remain below zero all year round. The concentration of salt in the water is similar to that in the Dead Sea; there are no living organisms or vegetation. The temperature in the mud lakes, unlike the salt ones, remains hot all year round. Here, if you plunge into a depth of 6 feet, you could be burned. Sol-Iletsk is a famous mud spa resort; tourists come here from Russia and the neighboring countries all year round. The town of Orsk is also close to Orenburg. The conventional boundary between Europe and Asia passes through it, so that its historic center is located in the Asian part of the continent, and the new construction is in the European part. In the city’s boundary, in the Polkovnik Mountain, Orsk variegated jasper is produced. It is famous throughout Russia, and the stone’s palette contains every color except blue. Products from Orsk jasper can be seen in the St. Petersburg Hermitage Museum: It was used for floors in the royal bedrooms of the Moscow Kremlin, and in finishing the Mayakovskaya metropolitan subway station. In the villages of Saraktash and Zheltoye, located 62 miles from Orenburg, the famous downy shawls are made: You can buy them from individual knitters or from the factories. Lovers of ecotourism should certainly visit the Orenburg Preserve, located at the junction of the ancient Ural Mountains and the Russian Plain. The steppe landscapes are predominant, and you can visit the nature preserve both as part of an organized group and as a volunteer. The famous Orenburg downy shawls (shawls, tippets, sweaters and much more) are made from Orenburg goats’ down. A real shawl can be passed through a ring: This is how thin the downy shawls that are worn as accessories are, but there are also "winter" options. Don’t leave without ornaments made from variegated jasper, which is produced in the neighboring town of Orsk. Orenburg is located in a zone of extreme continental climate; that is, one can observe and feel the temperatures ranging from 40 degrees below zero to 104 degrees Fahrenheit. The warmest month is July, and the coldest is January. The most pleasant time to travel to the Orenburg region is at the end of May and the beginning of June, when the steppe is blooming.